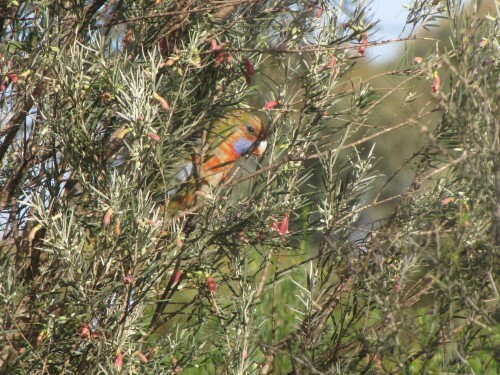 Last weekend we were having breakfast in our sun-room when four Adelaide Rosellas flew into one of the bushes in our garden, an Eremophila youngii (see photo above). I had the camera ready for many minutes but they would not come out into full sunlight and the above photo is the best I captured on this occasion. Just one bird is seen peeking out to see what was happening around it. The others were hidden in the foliage, busy feeding on the nectar in the flowers. The Adelaide Rosella is now a frequent visitor to our garden. It is a race of the widespread Crimson Rosella and confined to the Adelaide region, Mt Lofty Ranges and mid-north of South Australia. Its occurrence here in Murray Bridge is a relatively recent extension of that range. 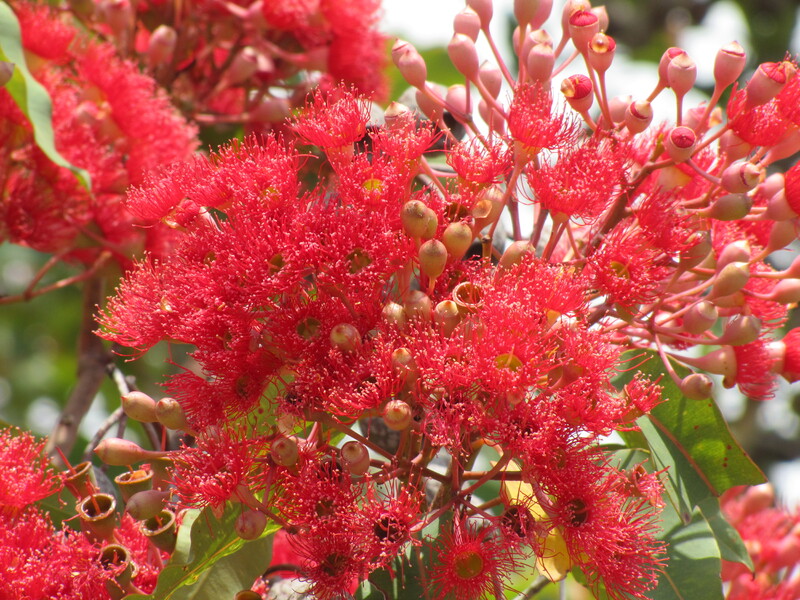 Over the years we have lived here we have planted many native Australian plants, not only for their attractiveness when they flower, but also to attract our native wildlife, especially the birds. We have quite a few eremophilas, grevilleas and correas as well as many others. The particular bush shown in the photo has flowers on it for much of the year so the rosellas and honeyeaters head for it on a daily basis. 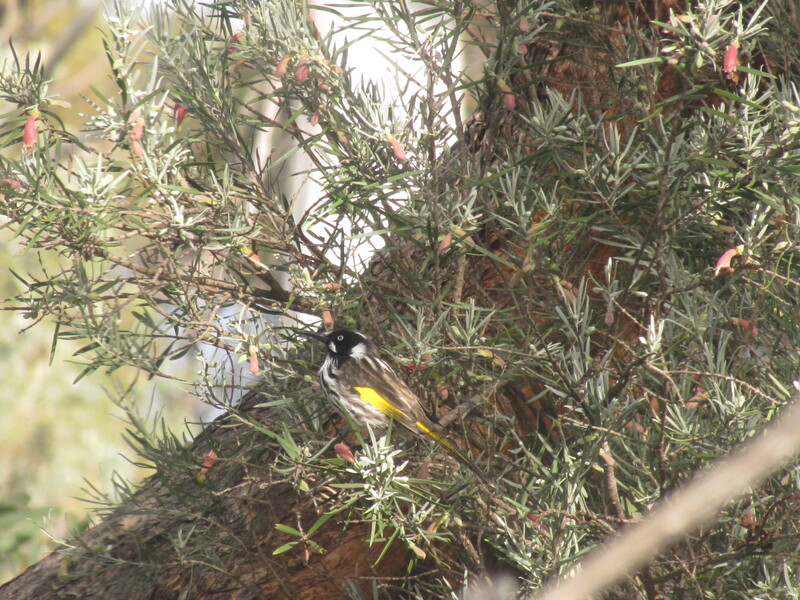 Below is another photo of the same bush, this time with a New Holland Honeyeater having a feed. I had a doctor’s appointment this morning. Nothing major; just a check up. Eleven crested pigeons were sitting there all fluffed up against the chilly morning and enjoying the early morning sunshine. It wasn’t a very big bush, so it looked really great. Crested Pigeons are very common in our area. I frequently see loose flocks of a dozen or more – sometimes as many as 30 or 40 – perched on power lines or fences. Once I even counted about 60 all in close proximity to one another. It was quite a sight. Mallee Ringneck parrots are common around my home town of Murray Bridge in South Australia. Almost everyday we have a small number visiting our garden. 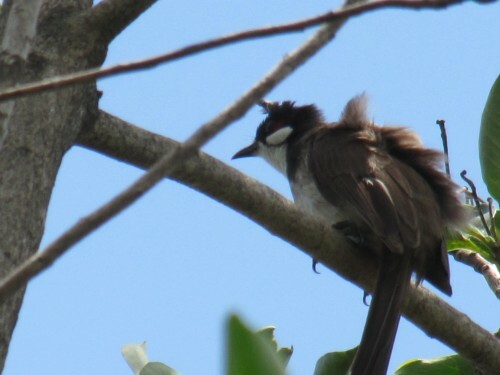 In fact, I would regard them as a resident species because there are very few days when we don’t see or hear them. They have taken a liking to the beautiful Eremophila plant shown in the photos on this post. The nectar in the flowers must be delightful to them. Of course, after they have visited each bush there is a carpet of petals on the ground under the bush.